My Outside Voice: Mystery Murder Party! I mentioned a few posts back (a few weeks ago) that for my birthday, we had a few friends over to celebrate my birthday by hosting a murder mystery dinner party. It was a ton of fun, and I am really glad that our friend J was here to help guide us through it. She had participated in a couple before, so she had a good idea of how it flowed. We sent invitations out a few weeks in advance with everyone's character assignments and pertinent information. I found these great invitations on Traylor Papers. We decided instead of doing a sit down dinner, this was more of a casual heavy apps and wine group, so I ran to Trader Joe's and picked up a few things, and then I also made pear with TJ's spreadable blue cheese wrapped in prosciutto, assorted cheese and crackers and a salad with strawberries, goat cheese arugula and candied walnuts with a champagne vinaigrette. I didn't do much for decorations but I always have fresh flowers, which I love. I don't think I can go a week without fresh flowers. I think working from home so much, it gives me something bright and cheery to look at it in passing! Ranunculus are one of my favorite flowers. I just LOVE them, but unfortunately they do not grow well in my zone. We had a wonderful group of friends, my sister and brother in law, T and sister J, our friend M and then J who was such a huge help. The boy even quit shaving for a few days to get into his character. My favorite though was our friend M who was Otto Van Schnapps and in the description of his character it said that he needed to wear Lederhosen so of course he had to find just the right costume. We had to have cake of course. We have a wonderful bakery by our new place and they make the most beautiful and delicious cake I think I have ever had. This is their Grasshopper cake, it is an extremely moist chocolate cake with a wonderful minty filling and the most delicious light whipped topping frosting. I thoroughly enjoyed this cake, and then promptly sent the other half home with my sister for my niece and nephews. 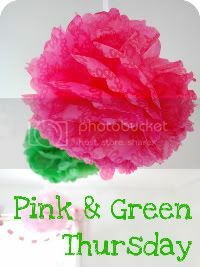 But I promise you, I am still thinking about it today. . Plus, its pink and green, how much better can you get? A week later when we went up to our friends L & J's cabin for the weekend, we celebrated not only my birthday, but L & J's as well. Another great reason to get another cake from Wuollet. This one we had decorated though, I won't be doing that again as I don't like that super sweet frosting. But again, it was so cute and so delicious! I would love to do another Murder Mystery Party, it was a ton of fun, and I cannot imagine spending my birthday any other way, with such wonderful friends. Wow that looks fun! Wish you were here this weekend to enjoy our chef dinner and help be make the house look fabulous.